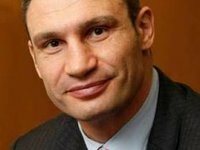 Kyiv Mayor Vitali Klitschko has been elected the leader of the Petro Poroshenko Bloc 'Solidarity' party. Earlier on Friday, Klitschko's predecessor at this post in the party and leader of the Petro Poroshenko Bloc parliamentary faction Yuriy Lutsenko asked the congress delegates to elect the Ukrainian capital's mayor as the new leader of this political force. "I suggest that Vitali Volodymyrovych Klitschko becomes the head of the Petro Poroshenko Bloc 'Solidarity'. This will symbolize complete unity and trust for the modernized party," Lutsenko told a congress of the UDAR party and the Petro Poroshenko Bloc 'Solidarity' in Kyiv on Friday.